Admittedly, the film is not very exciting. The Brandenburg Gate depicted in the hologram does not move. And yet this is a film: about 800 billion times faster than a normal feature film. The image frequency is only 50 trillionth of a second or, in researchers' terms, 50 femtoseconds. The high resolution of 10-9 metres enables the scientists to identify the tiniest nano-scale structures in the images. Even films featuring electrons are possible using special methods. The researchers aim at observing, understanding and, in the long term, specifically changing processes at the molecular and atomic level. Transitions from one state into another are particularly interesting, such as those taking place during ultrafast molecular processes inside cells and chemical reactions. For instance, it is possible to observe the splitting of a water molecule into its two components oxygen and hydrogen. This is why researchers do not need feature films but rather short films. They would be happy with only three images: start – reaction – conclusion. A 10-image film would count as a feature film. Technically speaking, in the future it may be possible to produce up to 100 images. The researchers' film studio was the X-ray laser FLASH at DESY: a free-electron laser generating the ultrashort, highly intensive flashes of soft X-rays needed for taking the pictures. 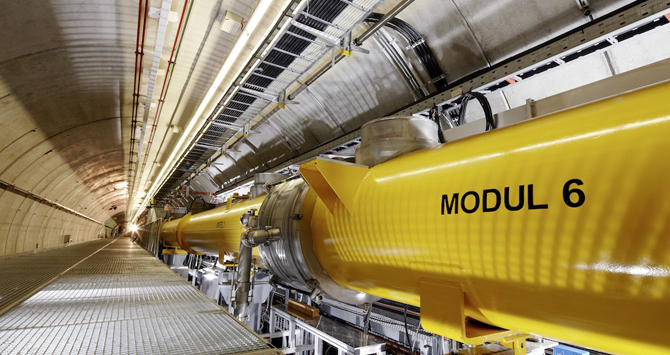 The 315-metre-long facility consists of three components: an accelerator accelerates the electrons to nearly the speed of light. The particles then pass through "undulators". This section consists of many hundreds of paired magnets that force the electrons into a slalom course. The thus oscillating particles emit short, strong laser flashes, which ultimately are transmitted into the experimentation room. For their 2012 experiment, the researchers divided the X-ray laser beam into two flashes. One flash was sent on a small detour course of only 0.015 millimetres, hitting the sample 50 femtoseconds after the first flash. The sample was a thin metal film into which the working group at the TU Berlin Institute for Optics and Atomic Physics had cut the image of the Brandenburg Gate using a lithographic method. As when using a camera, all that remained to do was take the pictures and save them. Since no detector allows for such fast reading, the scientists saved both images as superimposed holograms from which they subsequently reconstructed the individual images. The "atomic age of film" will begin at DESY in Hamburg the latest in 2017. The European X-ray free electron laser XFEL will be commissioned in that year. The resolution provided by XFEL with be higher to the factor 10 to 100 compared to FLASH1 and 2. This will enable scientists to observe and film details of viruses and cells as well as chemical reactions with a hitherto unmatched degree of detail. As a child, Jens Stadlmann enjoyed tinkering with bicycles, and today he takes care of the particle-accelerator facilities at the GSI Helmholtz Centre for Heavy Ion Research in Darmstadt.